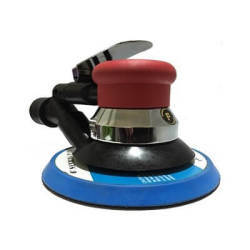 This is the only one ultra lightweight Random Orbital Sander 1.5 lbs in the world. High-strength, composite rotor has better lubricating qualities, allowing blades to last longer. Less air is used more efficiently to maintain maximum power. Good hand touch feeling silica gel material to enhance operator comfort and prevent machine slipping to make operator use more smoothly . It also use high quality sanding pad and bearings(made in Japan) to make machine working very stable. Invention patented air motor protection to make machine be lightweight, stronger and better vacuum capabilities. Also offer over 8 hours continuously using without change machine for increasing working efficiency. Base on user’s habits to adjust weight from 1.5 lbs to 1.94 lbs by a housing. Heavy type could be put on the housing for flat operation and lightweight type could take off the housing for vertical operation. Easy and flexible to adjust weight. 1. Ultra lightweight, powerful, High-Speed, Nice stability and better vibration are suitable for anyone operate on the irregular plan. 2. Nice Stability for long time use to have great efficiency. 3. Panel-beating, car painting, wood working, Auto Detailing and polishing application.